1. …………………. is an essential process where intelligent methods are applied to extract data patterns. 2. Data mining can also applied to other forms such as ……………. 3. Which of the following is not a data mining functionality? 4. ……………………….. is a summarization of the general characteristics or features of a target class of data. 5. ……………………….. is a comparison of the general features of the target class data objects against the general features of objects from one or multiple contrasting classes. 6. Strategic value of data mining is …………………. 7. ……………………….. is the process of finding a model that describes and distinguishes data classes or concepts. 8. 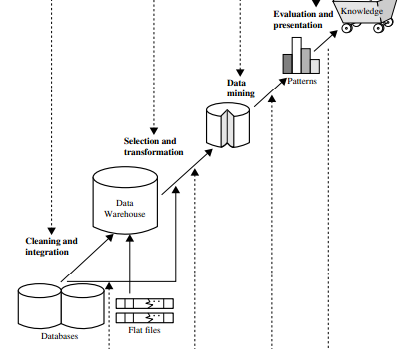 The various aspects of data mining methodologies is/are ………………. iii) Pattern evaluation and pattern or constraint-guided mining. 10. The out put of KDD is ………….